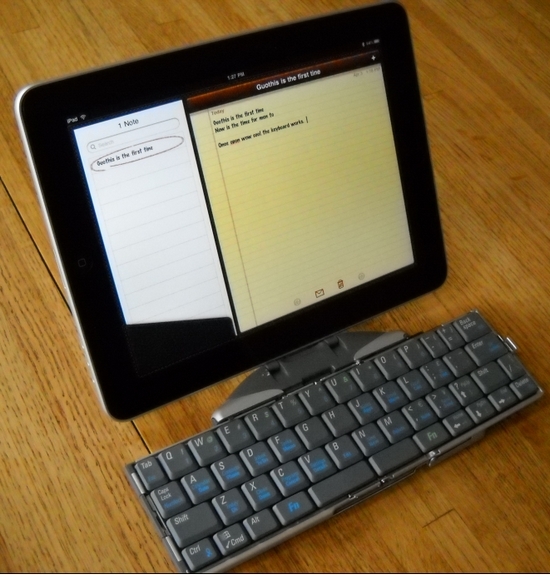 Summary: While the iPad, iPhone, and iPod touchscreen keyboards are adequate for many uses, sometimes you may want to connect a regular fully sized keyboard to your iPad or iPhone or iPod Touch. Here's how to do it. Those of you who are familiar with the iPhone or the iPod Touch know that Apple's touchscreen keyboard is a bit different than a regular keyboard. Most importantly, because you're tapping a flat screen, there's no tactile response. The iPad's screen keyboard, when in landscape mode, is a bit better than a iPhone keyboard, because it's bigger, but the Apple iPad keyboard is still not the same as a regular keyboard. Fortunately you can easily connect any regular bluetooth wireless keyboard to the iPad iPhone or iPod Touch using the device's bluetooth wireless compatibility. 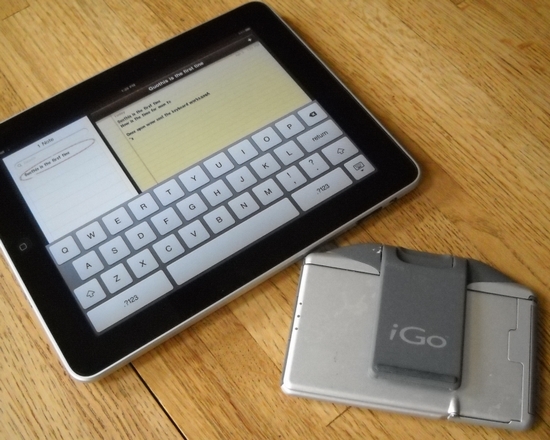 Adsense Below is the same iGo portable keyboard folded in half so that it can be tucked in a pocket, bag, or purse. How to connect a regular wireless Bluetooth Keyboard to your iPad, iPhone, or iPod Touch. Absolutely awesome. For somebody whose held out hope for an iPhone keyboard for years, this looks wonderful! Hey! I was trying to pair my ipad with my old school white apple bluetooth keyboard, but it wont work. any ideas? Why won’t it work? Does your ipod find the Apple Bluetooth keyboard when both are in discovery mode? Write me with the model of your Apple Bluetooth Keyboard model number and maybe someone here can help make it work. My old white apple bluetooth keyboard won’t pair with my iPad either. The iPad spins a long time and either nothing comes up or I get a message it can’t pair. Keyboard model number A1016. Thanks. iGo keyboards seen to be going for more on eBay since you published this one! 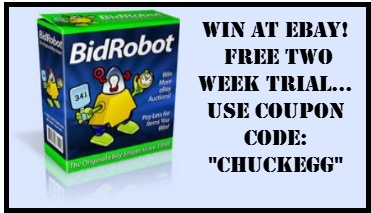 Chuck’s reply: just keep watching eBay – Occasionally the iGo keyboards will still sell for less. A heads up, Chuck, regarding the old white Bluetooth keyboard. I’m also struggling with it, and one thing I’ve observed is that, when trying to pair, if I hit return on the keyboard I get a pairing key briefly displayed, which goes away right away and the pairing then fails. Seems like it may be displaying the pairing key on an invisible layer until the enter key is hit. Seen similar info on other sites, but have not found a solution yet. Same issue here with the old white bluetooth keyboard from apple. (Model A1016). Removed it from my Mac Pro bluetooth devices list and turned off bluetooth from all other computers in the house to be safe. Just as Rick said, the keyboard will spin indefinitely unless/until the return key is pressed. Once pressed, the info on what to type for pairing will flash for a split second and then a new info bubble pops up saying the bluetooth pairing failed. Thanks for your site/info by the way. ChuckEgg’s Reply: The iPad’s Bluetooth specifications are Bluetooth 2.1 + Enhanced Data Range (EDR) technology. The iPad’s Bluetooth 2.1 and EDR are supposed to be backward compatible with bluetooth keyboards all the way back to Bluetooth 1.2. Your White Apple Bluetooth Keyboard (model A1016) may simply be too old (or apple used some proprietary non-standard protocol or timing) so that particular model isn’t compatible with the iPad’s 2.1 Bluetooth. Great information, Chuck! I bought the Palm folding keyboard, at your recommendation (along with the iGo) and feel more productive on the iPad. 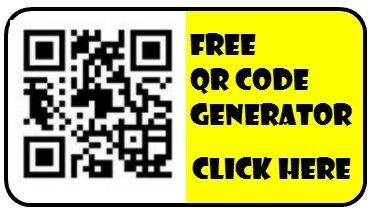 Keep up the great work of showing us great gadgets and technology, and showing us how to use them. Okay, I bought an el-cheapo bluetooth keyboard on eBay. It mostly works. I’m typing on it right now. But, I can’t get it to type a backslash. Mostly the iPad seems to be interpreting the keystrokes based on the traditional location of various characters. For example, shift-3 gives me a # symbol even though it is labeled with the symbol for the British Pound (fancy L with a cross). When I connect this keyboard to my MacBook Pro, They key to the right of the single quote generates a backslash. 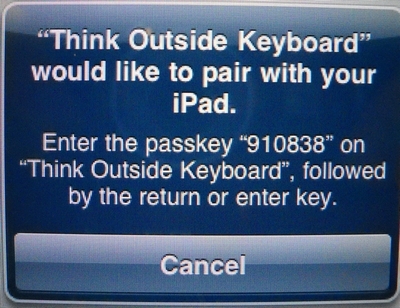 But, when connected to an iPad, this key doesn’t do anything. I tried fiddling with different keyboard selections in the Settings app. This actually makes a difference. For example, if I picked an international keyboard, then typing a backquote followed by an e gives me an e with an accent on it. Like what you would get with a option-e e.
I do need to type backslashes though! While my Apple keyboard generally works fine with my iphone and ipad apps and allows me to use the numbers on the top row regulalry, for some reason, when I’m in the Digits Calculator app, those numbers wont work and I have to input the numbers by hand on the ipad/iphone screen. Any ideas to help this?